EMI NEVE CONSOLE configured 72/24/24 with 192 in remix. Console features 72 channels with 1091 Mic Pre,s 1975 routing and 1294 line input module. Each channel has 2 line inputs as well as mic. Mic is handled by the 1091, but when the line button is pressed the channel takes its signal from the 1294 line module on which there is a stepped gain knob with trim. This means you can set the gains of mic and line and not disturb them when switching from one to the other, A VERY rare thing on a Neve. There is a vu meter of channel level in each 1294. The passive aux section has 8 aux paired with pre/post and level per pair. The 1975 routing module has left right and separate front-back panning. It has a three position switch,”track” sends to the 24 busses. “Group” sends to the group busses 1 to 12, which go to the patch. “Mon” sends directly to the 4 track buss, so a channel is heard without going via the monitor section. 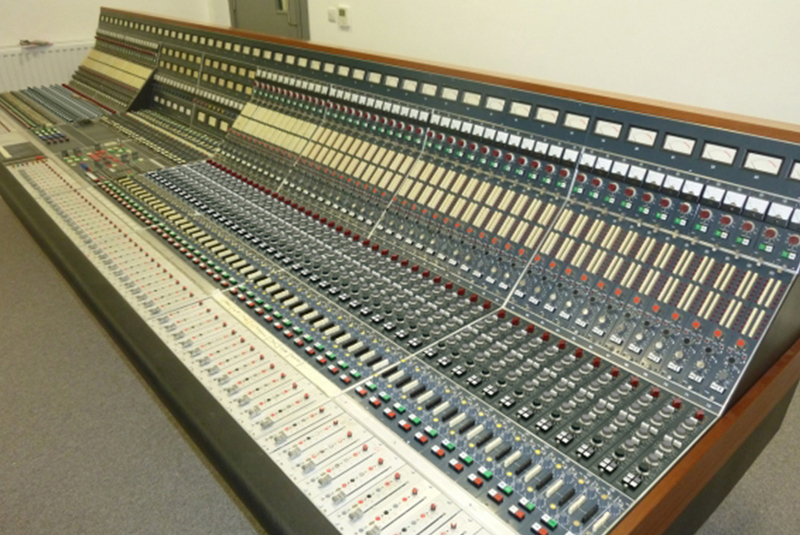 The 24 channel monitor section (1978 modules) are in the centre section, and feeds the 4 track buss also, so can be used as returns, to give 96 at mixdown. The four auxs on the monitor section go to the patch as separate outputs. Each of the 12 aux busses has its own level control and meter in the meter section. The console is very quite, since changing the B-/ rounding in line with todays quieter recorders. The B- cables are now so much thicker, and the B- bar through the console is 13mm square, as opposed to the 6.3mm original. Another important thing to bear in mind is that on the original EMI/NEVES, the busses were not continuous cables but linked across the centre section. This was not a good idea? They are now continuous through the centre section so the busses are 14 ft 6 inches long. The EMI phase meter/correalator is really useful, it reads down to about -65DB and can spot something noisy in the control room before you do, and will read high frequencies too. 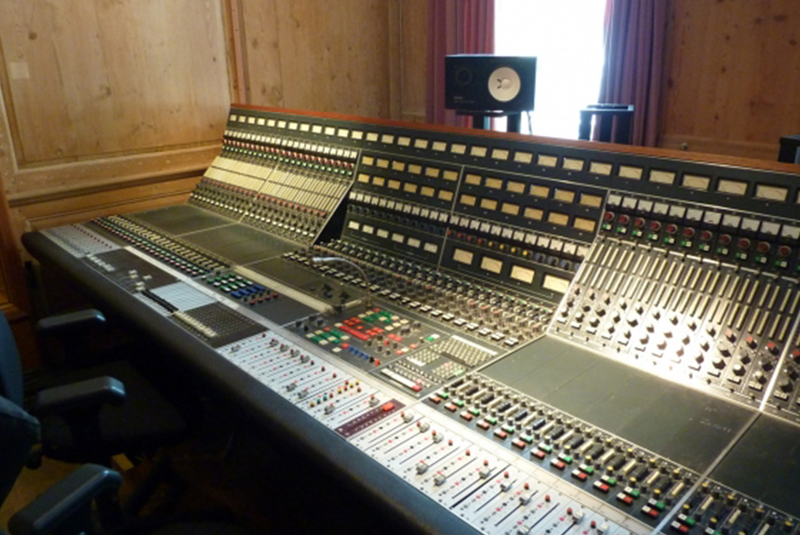 This EMI/NEVE console has been rebuilt by Blake Devitt over a period of seven years.